David Meerman Scott co-created the Web Strategy Planning Template with Bluewire Media in 2010. It was designed as a free tool to help organisations develop their web marketing strategy. When David was in Australia earlier this year, we asked him to explain how to use the template and why it is so useful. “Hey how’s it going? So, I just flew 14 hours from Los Angeles to do a little bit of surfing, and here we are, had a good lunch today with the guys. You know we’ve been working on this template – this Marketing Strategy Planning Template, and it’s really important because when I talk to people about the ideas in my books they understand it. They totally get the ideas from “The New Rules of Marketing & PR” and “Real-Time Marketing & PR” but what it’s really hard for people to do sometimes is to do the implementation. So this template allows you to be able to see the steps involved in implementing and also to predict the outcomes. In other words that you are going to drive search engine results, you’re going to drive sign-ups, you’re going to drive more people as part of your infrastructure, and more people as facebook fans, twitter followers and so on. They are free to download. No registration is required. And feel free to share with your friends! 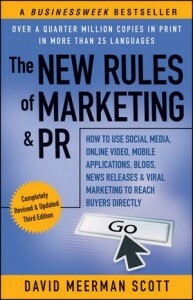 The 3rd edition of David’s book “The New Rules of Marketing & PR” has just been released. Congratulations David, we look forward to reading it! And thanks for collaborating with us on the Web Strategy Planning Template.